I attended an Electronic Frontier Foundation fundraiser this evening in San Francisco. 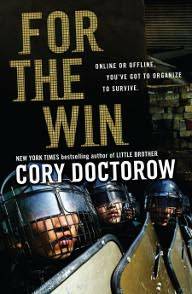 Cory Doctorow has been in the Bay Area for a few days on his book tour for his new novel, “For the Win.” He was at Borderlands and Book, Inc. and then a bunch of high schools (it is a Young Adult book, his second). I chose to go to the EFF event as an EFF member to show support for it and because I figured that Cory was more likely to speak about tech related issues there, since he used to work for the EFF and much of the audience would be geeks. Cory spoke for about an hour. He did a short reading from the book (actually reading a section that I had just read last night) and then did a brief talk on copyright and why it matters to more than just authors. It was actually a bit different than the “standard” speech on it that I’ve heard from him before and was classic Doctorow in covering a bit of the current landscape in copyright and why people should care, given that most of what happens on the Internet is affected by this fight. I freely admit to being a huge fanboy of his work. I’ve been reading Boing Boing since at least 2004 (and I’ve even been boingboing’d once) and have read all of his novels as they’ve come out. Being a professional computer geek that got his start in the late 1980s running a BBS and hacking into the local university’s unix machines and network, I’m probably his ideal audience in many ways. That said, I think that he has a lot to say and the Internet is everywhere today, affecting everyone in our society. FTW is about union organizing amongst third world gold farmers in MMORGs but the economics and the ideas about labor and individual freedom and self-direction are applicable to anyone. I’m planning on getting my daughter a copy of it now that she’s 14 and old enough to be reading his YA works. I contacted Cory about recording his reading the other day. I’ve previously recorded him at SF in SF with Rudy Rucker and at the late Cody’s Books of Berkeley when he was touring for “Little Brother,” his last YA book. This was the first time that he was heavily microphoned and the audio is clear but hardly ideal quality because it was coming from large speakers and not simply recording his normal speaking voice. He offered to have me plugged into the sound board but, unfortunately, my current Edirol R-09 device can’t handle XLR inputs so I was stuck with it on the table next to him. I plan to post my review of his book in the next day or two when I finish it. So far, I’m enjoying it quite a bit though I believe that “Makers” will continue to be my favorite by him. I have made the audio available at the Internet Archive.